Designed in 2006, DisplayPort is a digital interface commonly seen in monitors. It was created to replace older ports like DVI and VGA and is a VESA standard. As of this writing, the latest version is DisplayPort 1.4, although many monitors still use DisplayPort 1.2, which has better bandwidth than both HDMI 1.4 and HDMI 2.0 and can easily support the following configurations: 4K at 60 Hz, 1440p at 144 Hz, and 1080p at 240 Hz. Monitors with at least one DisplayPort are easy to find. 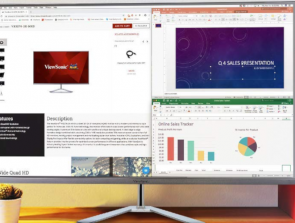 But finding the best DisplayPort monitors for productivity and office work is a much more difficult task, considering the number of options on the market. There are all-around monitors that work well for different tasks, including art-related work, and there are monitors that are best used for basic office work only. Fortunately for you, we already got you covered with this guide. Below are the top DisplayPort monitors that you can get today, from a versatile 4K monitor to an ultrawide monitor. Some of the items on this list come with a Mini DisplayPort – a miniaturized DisplayPort created by Apple in 2008 – while others also offer a DisplayPort Out for daisy chaining. All monitors listed here come with a DisplayPort 1.2, which is more than enough for non-gaming use. This has a fully adjustable stand and lots of connection options. Superb color accuracy and a well designed OSD. 4K UHD resolution, HDR support, and great color accuracy. 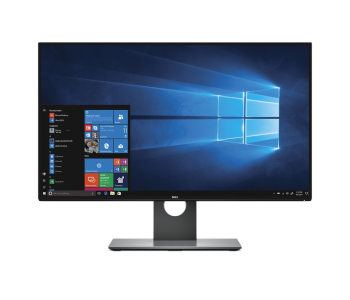 A 27-inch display, the Dell U2718Q is an outstanding monitor for productivity and general use, featuring an IPS panel with a 4K native resolution and a 60 Hz refresh rate. It’s one of the best IPS monitors out on the market, and the best part is that you can get it for under $500 when it’s on sale, which happens regularly. Like other models under the Dell UltraSharp series, the U2718Q has a minimalist design, with thin bezels at all sides, a no-frills back panel, and no internal speakers. The unit comes with a sturdy stand with a small hole for cable management. You can easily adjust the screen position, with options to adjust the height, tilt, swivel, and pivot to portrait mode. The U2718Q is a versatile display that works well in different setups. The quick-release stand and the VESA mount on the back panel allow for easy mounting to a wall mount or monitor arm, while the thin bezels and the pivot adjustment are great if you want a multi-monitor setup. Feel free to tinker with whatever setup works best for you. 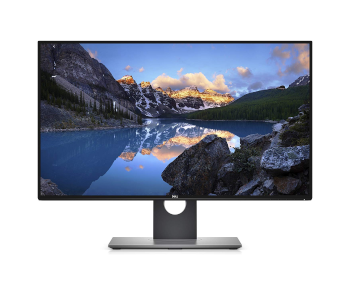 Regarding connectivity, the U2718Q is just as good as most of Dell’s office monitors, offering multiple video inputs and accessory ports, almost all of which are down-facing on the back panel, right below the VESA mount. It has one HDMI 2.0 port, one DisplayPort 1.2, one Mini DisplayPort 1.2, one audio out, and four USB 3.0 ports. Of the four USB ports, two of which support fast charging; additionally, two of the USB ports are located on monitor’s side for quick access. The on-screen display is well designed, featuring an organized menu structure and a good selection of calibration options. For controls, there is a set of buttons located on the bottom-right corner of the monitor, under the bottom bezel, along with the power button. While not as intuitive as the joystick control seen in LG displays, the four-button control scheme is good and won’t pose any issues. Featuring HDR support and excellent coverage for the sRGB color space, the U2718Q is an all-around display that works well for different tasks. You can use it for photo/video editing, web development, graphics design, watching movies, and internet surfing, among other things. It’s great for multitasking with multiple windows open and boasts wide viewing angles. Moreover, the U2718Q has good brightness and reflection handling, which is perfect if you usually work in a bright room. The out-of-box color accuracy is good as well, but for photo editing and other art-related work, it’s best to calibrate the monitor first. On the flip side, this Dell product has subpar contrast and black uniformity, but compared to most other IPS displays, it’s one of the better ones on both fronts. The U2718Q also works well for gaming, though not for fast-paced competitive games. It has a fast response time for an IPS monitor and a low input lag regardless of the resolution. 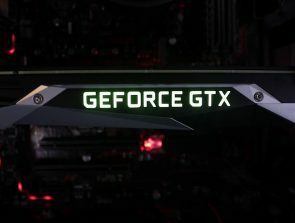 You can use it for PC and console gaming, especially if you mostly play games with pretty graphics, such as Assassin’s Creed Odyssey, Far Cry 5, God of War, and The Witcher 3: Wild Hunt. Overall, the U2718Q is a fantastic all-around 4K monitor. It’s great for productivity, whether as a standalone unit or as a part of a multi-monitor setup. It has great picture quality, good ergonomics, and lots of connection ports. If your budget for the best DisplayPort monitors is around $500, this Dell 4K monitor is the first product you should check out. If you want a cheap monitor, there are a lot of options under $150. However, many of them are very limited, especially regarding connection ports and ergonomics. If you want a budget monitor that offers great value for the money, get the ViewSonic VP2468, which sells for just around $200. It’s got multiple DisplayPorts, including a DisplayPort Out for daisy chaining. The VP2468 is a 24-inch monitor with an IPS panel, a Full HD resolution, and a 60 Hz refresh rate. It has a more professional design compared to the ViewSonic XG2402, a budget gaming monitor in the same price range. It has a well-built casing with thin bezels, an anti-glare screen coating, and a set of clickable buttons on the backside. Unlike many budget monitors, this ViewSonic display comes with a sturdy stand that easily supports the monitor and offers full adjustment options, including a 21-degree backward tilt and a pivot adjustment in both directions. There is also a 100 x 100 mm VESA mount on the back panel if you want to mount the unit to a monitor arm or wall mount, either for a dual monitor setup or simply for a cleaner desk setup. ViewSonic didn’t hold back when it comes to connectivity, equipping the VP2468 with a number of ports, all of which are down-facing at the back. Clearly labeled with small icons, the ports include a couple of HDMI 1.4 ports, one DisplayPort 1.2, one Mini DisplayPort 1.2, one DisplayPort Out 1.2, one audio out, and a total of four USB 3.0 down ports. That’s a lineup you don’t see very often, most especially in a monitor selling for less than $300. The DisplayPort Out is great if you are going to use the VP2468 for a dual monitor setup. You can use that port for daisy chaining. A daisy-chained multi-monitor setup allows for a cleaner desk with fewer cables because only one unit needs to be connected to your PC. Meanwhile, the Mini DisplayPort is useful if you plan to connect the monitor to an older MacBook. The VP2468 is a solid all-around monitor with good color accuracy out of the box. It has good picture quality overall, with wide viewing angles and decent brightness. You can use it for general office work and media consumption, but don’t expect it to be as good as our top pick for multitasking with three or four windows open at the same time. The on-screen display has a nice selection of options to choose from if you want to customize your setup. For gaming, the VP2468 is definitely not as good as the ViewSonic XG2402, especially for fast-paced competitive games. You can use it for casual gaming, with the monitor featuring a good response time and input lag. But for serious gaming, there are far better options on the market, including cheap monitors with a higher refresh rate and adaptive sync tech. 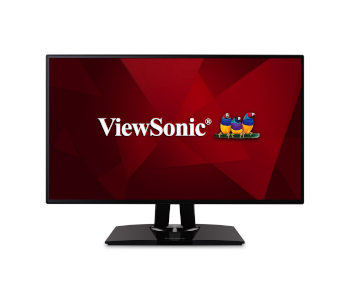 In all, this ViewSonic monitor is a great product that comes with features not usually seen in most other budget monitors. It has good color accuracy and wide viewing angles and offers multiple connection options for versatility. If you want a budget monitor for productivity, the VP2468 is one of the best products currently out. If you like what the ViewSonic VP2468 brings to the table but prefer a larger screen with a higher native resolution, check out the Dell U2717D. It’s an IPS monitor with a 27-inch screen and a QHD resolution, so it’s more suitable for multitasking than ViewSonic’s offering. You can get it for just around $300-350, which makes it more affordable than our top pick. In design, the U2717D is identical to the Dell U2718Q, which isn’t surprising considering both are Dell UltraSharp models. It’s got a minimalist profile, with thin bezels at all sides, a quick-release stand, and a simple back panel with not much branding. There are no built-in speakers in this monitor, which isn’t exactly a big deal considering monitor speakers are not that great anyway. Like our top pick, this Dell monitor comes with a well-built stand with a small hole near the bottom for cable management. The stand is easy to adjust out of the box and offers full adjustability, including a 45-degree swivel range in both directions and the option to rotate to portrait mode. If you want to mount the monitor to a wall mount or monitor arm, there is a 100 x 100 mm VESA mount at the back. The U2717D is almost identical to our budget pick concerning the number of connection ports, featuring one HDMI 1.4 port, one DisplayPort 1.2, one Mini DisplayPort 1.2, one DisplayPort Out 1.2, one audio out, and four USB 3.0 down ports. Of the four USB down ports, two of which are located on the monitor’s side for quick access, with one port offering fast charging support. All the other ports are down-facing on the back panel, below the VESA mount, which makes them somewhat difficult to access, especially when the monitor is placed close to the wall. With the DisplayPort Out, you can use this monitor for daisy chaining, which allows for a more clutter-free multi-monitor setup with fewer cables to keep in line. 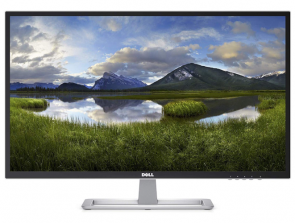 Like most other Dell professional monitors, the U2717D is equipped with a well-organized on-screen display with a good selection of options. The on-screen display is easy to go through while the menu controls, located on the bottom-right corner of the monitor, are comfortable to use and produce a nice click when pressed. While not as versatile as the Dell U2718Q, the U2717D is an excellent QHD monitor for productivity and general use. It has wide viewing angles and good brightness and boasts an almost perfect coverage for the sRGB color space, which is good news if you want to use it for photo editing and other art-related work. On the other hand, this Dell monitor, like almost all other IPS monitors, has a subpar contrast ratio. Among our top three picks in this guide, the U2717D is the least suitable for gaming, most especially if you mainly play fast-paced competitive games like Overwatch. It’s decent enough for casual gaming, though, especially if you like to play turn-based RPGs and adventure games. But if you want a QHD monitor that’s great for both productivity and gaming, there are other options out there, with the Asus display included on this list being one of the best. Overall, the U2717D is a well-designed QHD monitor with good build quality, featuring multiple input options, good ergonomics, and excellent color accuracy. It’s a recommended monitor for a dual monitor setup – either as the main screen or as the side screen next to a larger display – if you want to increase your productivity. The LG 34UM88C-P is a great option if you want an ultrawide monitor for productivity and general use, featuring good connectivity, excellent color accuracy, and surprisingly decent speakers. It sells for just around $450, which makes it one of the most affordable 34-inch ultrawide displays with a 1440p resolution. An IPS monitor with a 60 Hz refresh rate, this LG product is well designed from top to bottom. It has thin bezels at the top and sides, with the company logo on the thicker bottom bezel. The screen has an anti-glare coating while the back panel has a glossy black finish. For menu control, there is a small joystick under the bottom bezel. Featuring a stylish crescent base, the stand easily supports the large screen and comes with a removable clip for basic cable management. Of the monitors in this guide, the 34UM88C-P is the most limited regarding ergonomics, only offering tilt and height adjustments. If you want more flexibility, you can mount it to a monitor arm or wall mount. But make sure to get a compatible mount, as mounts designed for regular-sized monitors might not be enough, considering the size and weight of this display. While there are many monitors that come with built-in speakers, only a select few actually offer at least decent sound quality, and the 34UM88C-P is one of them. Enhanced by Waves MaxxAudio, the 7-watt built-in speakers fire out from the bottom and deliver a surprisingly decent sound. You can use them for watching movies and listening to music if your external speakers or headphones are not available. For connectivity, the 34UM88C-P has two HDMI 2.0 ports, one DisplayPort 1.2, one analog audio out, and two USB 3.0 down ports, one of which supports quick charging. Unlike with our top three picks, all the ports are outward-positioned on the back panel, which makes them easy to see even when the display is sitting close to the wall. The 34UM88C-P is easy to set up out of the box. Using the intuitive joystick control, you can easily go through the on-screen display to change some of the settings. The menu layout is organized and there is a good selection of calibration options. The internal menu also includes a few gaming-focused features, such as gaming modes designed for specific genres and a Black Stabilizer option. Regarding performance, the 34UM88C-P is great, boasting excellent coverage for the sRGB color space, which is great for photo editing, and very good viewing angles. The brightness is good while the contrast is somewhat decent for an IPS panel but still subpar compared to VA panels. 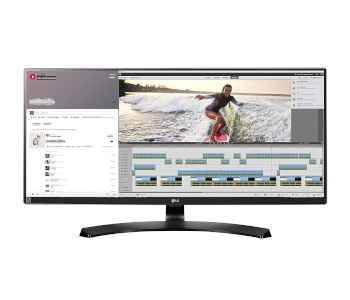 For productivity, this LG offering is fantastic, with the ultrawide screen allowing for easy multitasking with multiple windows open at the same time. You can use it for photo/video editing, graphics design, CAD software, coding, and watching movies, among others. The 34UM88C-P is also a good monitor for regular gaming. It has a fast response time and a low input lag and supports AMD FreeSync. With FreeSync enabled, screen tearing is reduced when the frame rate becomes erratic during graphics-heavy scenes in games. But keep in mind that the adaptive sync tech is only supported over DisplayPort. If you want a 34-inch ultrawide monitor for productivity, the 34UM88C-P is one of the best products out there, offering great value at a very reasonable price point. It has good build quality, featuring multiple inputs, a height-adjustable stand, and decent-sounding speakers. If, however, you want the opposite and prefer an ultrawide monitor that’s more suitable for watching movies and gaming than productivity, consider the best curved ultrawide monitors instead. Some monitors are great for productivity. Others are great for gaming. 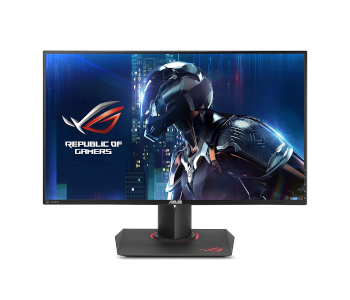 And then there are monitors that are equally excellent on both fronts, such as the Asus ROG Swift PG279QZ. An IPS display with a 27-inch screen and a QHD resolution, the PG279QZ is the updated version of the PG279Q, one of the best gaming monitors out there. You can get it for about $600, which makes it more affordable than the older model. Of the monitors in this guide, the PG279QZ has the most stylish design, featuring thin bezels and a cool lighting system on the stand. The back panel has vents running along the sides and top and features a 100 x 100 mm VESA mount if you want to mount it on the wall or to a monitor arm for a more clutter-free desk. There are internal speakers in this monitor, but unlike with the LG offering above, the sound quality of the speakers is not that great. The stand, which has integrated cable management, offers excellent ergonomics with full adjustment options, including an impressive 60-degree swivel range in both directions. You can easily adjust the screen position for a more comfortable setup. The ring and ROG logo in the stand’s flat base light up, which is cool but can be distracting sometimes. Regarding connectivity, the PG279QZ is not that different from other G-Sync monitors, only offering one DisplayPort 1.2 and one HDMI 1.4, with the adaptive sync support limited to the former. In addition, there are two USB 3.0 down ports and one audio out in this monitor, all of which are down-facing on the back panel together with the video inputs. Like many LG monitors, this Asus product comes with an intuitive joystick for menu control, but instead of on the underside, the small joystick is located on the backside, along with a set of clickable buttons. The joystick is easy to use, though some of you might find it awkward to use at first, especially if you are upgrading from a very old monitor. The OSD itself is also well designed, with a good selection of calibration options and gaming functions. The PG279QZ is a great monitor for productivity and general use, featuring good out-of-box color accuracy, wide viewing angles, and decent brightness. You can use it for graphics design, web development, general office work, media consumption, and internet surfing, among others. While not as good as the older PG279Q regarding brightness, the PG279QZ is still a suitable monitor for usage in a bright room. For gaming, this Asus display is even better, which isn’t surprising considering it’s built for serious gaming. 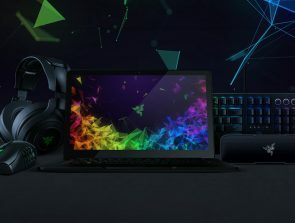 It’s got a very low input lag, G-Sync support for reduced screen tearing, and a high native refresh rate of 144 Hz, which can be easily overclocked to 165 Hz. It’s perfect for fast-paced games, such as racing games and first-person shooters, boasting an exceptional response time. Whether you play fast-paced games like Overwatch and Call of Duty: Black Ops 4 or action RPGs like Monster Hunter: World and Fallout 4, you are going to love this G-Sync monitor. All in all, the PG279QZ is an outstanding all-around monitor. Although it’s primarily marketed as a gaming monitor, it also works really well for productivity and general use. It has good picture quality and boasts an excellent gaming performance. If you want the best DisplayPort monitor for both serious gaming and productivity, go for the PG279QZ.